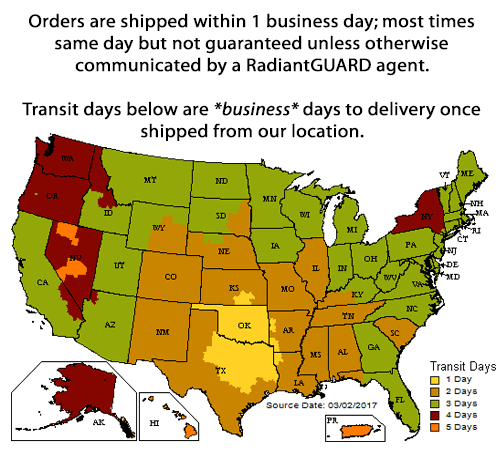 RadiantGUARD® radiant barrier and reflective insulation products can be used in unlimited ways to help control the transfer of heat. Below are just a few of the popular building applications. Most of the heat entering a home comes through the roof. RadiantGUARD® radiant barrier foil insulation installed in an attics can reduce attic temperatures by up to 30 degrees when stapled with a staple gun to the underside of roof rafters by REFLECTING up to 97% of the radiant heat that strikes its surface thereby reducing heat transfer from the attic to living spaces resulting in lower utility bills. This method also reduces the heat subject to attic mounted AC duct work thereby allowing them to work more efficiently. A secondary method of installation, instead of installing under the attic rafters, is to lay the foil insulation over the attic floor. Although this method of laying over the attic floor won't lower the temperature of your attic space, it will still REFLECT up to 97% of the radiant heat that strikes its surface thereby reducing heat transfer from the attic to living spaces resulting in lower utility bills. To compensate for the exposed AC duct work with this installation method, you can easily lay a blanket of radiant barrier over the duct work to protect them from the heat. Note: If you choose to install over the attic floor, keep in mind that condensation may form under a perforated radiant barrier based on sudden extreme temperature differences between the air below the barrier and above the barrier typically found in colder climates in the winter. Read more about condensation buildup). The following tips are provided to help reduce the labor time involved when installing radiant barrier and make your radiant barrier installation project and easy one. Start early in the morning when your attic is at its coolest. Carry all of your radiant barrier and tools into the attic to avoid unnecessary trips to and fro. Keep plenty of water on hand and drink even if you don't think you're thirsty; especially in the summer months. If your attic is not well lit, bring some type of additional lighting source. Find a centrally located area to set up your work area. Always be cautious of the attic floor joists you walk on. Some have a tendency of "rolling" when not securely fastened to the floor of the attic. For Do-It-Yourself-ers, don't try to complete a large job in one day. Take your time and spread the installation out over several days taking advantage of the cooler hours of the day. For professional contractors, work in groups of two to three. Having someone focused on cutting the product and handing it over to someone else installing it helps cut down installation times. Suggested Product: RadiantGUARD® Ultima-foil radiant barrier breathable (this version is perforated to allow moisture from home to easily pass through and out of your home). Starting 3" from the top peak (or ridge vent), install our Ultima-FOIL breathable radiant barrier across the bottom of the rafters (horizontal / perpendicular to rafters) from one end of the roof to the other. Staple the radiant barrier to each rafter. Note: If your roof peak is too high, choose a point and create a faux ceiling with the radiant barrier going from one side of the roof to the other side (this is called the "flat top" method) then follow the remaining instructions for all sides of your roof. Working your way down towards the bottom of the roof, install a second row overlapping the first row by two (2) inches and staple to each rafter. Continue the instructions until you reach the wall plate. “Wall plate” is the horizontal piece of lumber located on the top of each exterior side wall of your structure. In the attic, the wall plate can be found along the outer edges of the attic floor. Any soffit vents will be beyond this wall plate. If you have gable walls (exterior vertical side walls of roof), install in the same manner making sure to cut out material over any and all air vents to allow for air flow. Suggested Product: RadiantGUARD® Ultima-foil radiant barrier breathable (**be aware that condensation may form under a perforated radiant barrier based on sudden extreme temperature differences between the air and above the radiant barrier typically found in colder climates in the winter. Read more about condensation buildup). Starting at one end of your attic, install our Ultima-FOIL breathable radiant barrier over across attic floor joists, plywood decking or existing insulation. Use a stick (1/4" furring strip with nail in the end works well) to help push the barrier into the tight spaces of your attic. Continue covering the attic floor by overlapping each section of radiant barrier already rolled out by 2" inches. When laying the foil insulation, it is not necessary to make it lie smooth or flat. It is also not necessary to tape the seams. You can staple the barrier in place if you wish but it's not necessary. Staple the radiant barrier to all knew walls located in your attic space overlapping each piece by 2". Cut out any material around appliances that produce heat and/or protude through the attic floor (canister lights) and mark any electrical junction boxes that are covered by the radiant barrier. A great tip related to laying the radiant barrier directly on the attic floor is to tape an outline of any underlying decking pieces you use to walk on to access various storage areas or equipment in your attic. By outlining these decking pieces with a brightly colored tape, you, and contractors or repairmen who access your attic in the future, will easily be able to see where it's safe to walk eliminating the risk of stepping in the wrong place through the ceiling drywall. Install unfaced mass insulation between rafters ensuring a minimum of 1" ventilation space between the mass insulation and the underside of the roof decking. Check with local codes to determine if you must maintain a larger air space. If necessary, you can install vent chutes or baffles to ensure the proper air flow channel. Unroll and staple reflective insulation to the under side of the rafters. Seal all seams with aluminum foil tape. Install drywall to the furring strips as usual. In the above states, you can staple the FOIL Double Bubble insulation directly to the roof decking instead of installing to the underside of the rafters as indicated above. You must leave at least a 1” airspace between the bubble insulation and the fiberglass insulation below. In this installation, you do not need to secure furring strips before attaching the drywall. Radiant barriers can be extremely effective at lowering radiant heat transfers when used in exterior siding applications but again, it MUST have an air space on at least one side of the radiant barrier for it to work. In this application, a radiant barrier is installed like a typical house wrap yet before the siding is installed, you must attach 1 X 2 furring strips over the top of the radiant barrier to which to attach the siding. This creates the required air space for the radiant barrier to be effective. Starting at one end of your attic, install our Ultima-foil breathable radiant barrier across attic floor joists, plywood decking or existing insulation. Use a stick (1/4" furring strip with nail in the end works well) to help push the barrier into the tight spaces of your attic. Cut out any material around appliances that produce heat and/or protrude through the attic floor (canister lights) and mark any electrical junction boxes that are covered by the radiant barrier. A radiant barrier can be very effective at BLOCKING radiant heat when installed in conjunction with roofing and siding material, however, the radiant barrier MUST be installed with an air space on at least one side of it. As long as there is at least a 3/4" air space on either side of the radiant barrier, the application will be effective at BLOCKING radiant heat. For more information on why a radiant barrier must have an air space on one side of it to be effective, please see our What is Radiant Barrier page. Roofing systems that utilize purlins or batten/counter battens are ideal for the addition of a radiant barrier because the roofing easily provides for the required air space already. Metal, tile, and slate roofing systems are examples of such roofing systems where a radiant barrier can be easily incorporated. Equally as important as the air space on a radiant barrier is the requirement that a radiant barrier remain clean and dry in any application. The picture below shows a batten/counter batten system with a slate/tile material with a radiant barrier on top of the counter battens. The radiant barrier is installed on the top of the counter battens in non-watertight applications. This allows the radiant barrier to remain dry while also achieving the 3/4" air space requirement. If the roofing material is watertight, installing the radiant barrier on top of the felt with the batten on top of it would be sufficient. We recommend our Ultima-FOIL vapor barrier (solid) radiant barrier product for roofing applications. Because a radiant barrier needs an air space on at least one side, installing it directly below felt and shingles will NOT allow the radiant barrier to block any radiant heat. Instead, the heat from the shingles and felt will conduct all the way through the barrier, into the attic, and eventually in the living spaces. If an asphalt shingle roof is being installed, you should install the radiant barrier to the underside of the roof decking or roof rafters in the attic space below. Note: Our bubble insulation products are solid vapor barriers (i.e. not vapor permeable) and therefore, serious moisture, health, and durability problems can result from improper installation. R-Values indicated below vary per installation method depending on the size of the air space surrounding the product and the direction of heat flow. Because of these variables, you can achieve several different R-Values with one basic product. Most people are familiar with extreme heat found in attic, but there is secondary method of heat transfer into a building structure; through the walls. Radiant barriers installed as house wraps during new construction projects or bubble insulation retrofitted into wall systems can block a majority of the heat that transfers through the walls into living spaces. 2" X 4" wall studs with R-13 un-faced - Assembly R-Value 16.0 (horizontal heat flow) - achieved by creating a 3/4" air space between bubble insulation and interior wall. 2" X 6" wall studs with R-19 un-faced - Assembly R-Value 22.0 (horizontal heat flow) - achieved by creating a 3/4" air space between bubble insulation and interior wall. Floor heating systems have been around for centuries to not only keep floors warm but to help heat the cooler air near the floor caused by cold air sinking while hot air rises in a room. A radiant barrier used in conjunction with radiant floor heating can help to lock in the heat in the floor so that it doesn't escape down into a basement or the ground below. Our reflective insulation is the ideal product for all radiant floor heating systems and serves as a vapor barrier to block moisture penetration from below. Installing under Floor Joists - R-Value: 17.0 (downward heat flow) - achieved by creating a 6" enclosed air space above the bubble insulation below the flooring above. Reflective insulation is also an ideal solution for keeping floors warm and blocking heat loss through flooring even without the use of radiant floor heating systems. When installed in a crawl space, our reflective insulation products will block up to 97% of the radiant heat loss that occurs through floors keeping floors warm and reducing cold drafts. This in turn keeps the living spaces warmer further increasing the comfort of the living space and reducing heating costs associated with maintaining a consistent room temperature. Crawl Space - R-Value 16.8 (downward heat flow) - achieved by creating a 9 1/2" enclosed air space between the bubble insulation and the flooring above. Bubble insulation not only blocks 95-97% of the radiant heat striking its surface, it also provides the necessary thermal break to eliminate condensation problems in metal buildings. Without Thermal Break - R-Value 7.6 (downward heat flow) R-Value 3.9 (upward heat flow)- achieved by creating a 3/4" nominal enclosed air space between roofing and bubble insulation and an 8" air space between insulation and the interior finish (if exists). Retrofit Metal Roofs (open interior) - R-Value 11 (downward heat flow) R-Value 4.4 (upward heat flow) - achieved by creating an 8" enclosed air space between the roofing and the bubble insulation. With Thermal Break - R-Value 5.6 (horizontal heat flow) - achieved by creating a 3/4" enclosed air space between the exterior finish and the bubble insulation and an 8" air space between the insulation and the interior finish. Retrofit Metal Walls (open interior) - R-Value 4.5 (horizontal heat flow) - achieved by creating an 8" enclosed air space between the exterior wall and the bubble insulation. Bubble insulation can also help block radiant heat in post frame building structures inhibiting dew point condensation problems. Our bubble insulation also does not provide a growth medium or nutritive value for fungus, insects, or rodents. Bottom of Purlins - R-Value 9 (downward heat flow) R-Value 4.4 (upward heat flow) - achieved by attaching to the underside of 2" x 4" roof purlins creating a 2" enclosed air space between bubble insulation and metal exterior roof. Above Purlins - R-Value 6.4 (downward heat flow) R-Value 4.3 (upward heat flow) - achieved by attaching to the top of 2" X 4" roof purlins with at least a 3/4" drape between purlins. Inside the Girts - R-Value 5.3 (horizontal heat flow) - achieved by creating a 1" air space between the bubble insulation and the outside panel. Outside the Girts - R-Value 4.7 (horizontal heat flow) - achieved by creating at least a 3/4" air space between the bubble insulation and the outside panel. WHITE bubble reflective insulation is the ideal choice for insulating new concrete floors against loss of heat. It can be used in conjunction with, or without, radiant heat tubing to help keep floors warm. The product is to be laid down with the FOIL side down towards the ground and WHITE side up over which the radiant heat tubing and fresh concrete are to be applied. The foil side is faced downwards to eliminate the concrete from coming in contact with it which could cause the foil to corrode due to the alkaline in the fresh concrete. WHITE Double Bubble insulation used in a concrete flooring application is stated to achieve an estimated R-Value of 1.1. "In order to more fully understand the influence of reflective insulation materials in concrete floor systems, RIMA obtained the services of a consulting firm specializing in thermal performance (R & D Services, Inc.). Thermal efficiency calculations were used to generate an estimate for a typical case involving reduction in heat loss for a common concrete floor system. The calculation is based on steady-state thermal conditions with an isothermal plane at the heating pipes and a plane between the gravel and the ground. The ground temperature was 55 degrees Fahrenheit, while the temperature of the heating pipes was 125 degrees Fahrenheit. The calculation assumes two inches of concrete (R-0.10) below the heating pipes, and five inches of gravel (R-0.75). A reflective insulation material (R-1.10) is located between the concrete and the gravel (the total thickness of the concrete floor system is roughly nine inches). The system R-value of R-1.95 reduces heat loss by 56% when compared to the same concrete floor system without insulation. Reflective insulation is excellent as a basement wall insulator. It performs as a vapor retarder, resists fungus and mold, and also controls dew point problems. R-Values are unaffected by a damp moisture basement environment unlike fiberglass insulation. Reflective insulation applications are only limited by your imagination. Below are a few more installation applications. Hot Water Heater - R-Value 4.5 (horizontal heat flow) - achieved with 5/8" air space between product and water heater. When installing on the attic floor, work from the outer most regions of the attic and work your way towards the middle (ideally where the "roll caddy" is located). Cut the longest pieces of barrier as fits when laying out in long run sections of your attic. It will cut down time spend on cutting and positioning smaller pieces. To determine the length of a piece of radiant barrier needed, count the number of floor joists or rafters that span the area you are working in and multiply this number by 2 if your rafter/joist span is 24". The resulting number is the linear feet of barrier you should cut to fit this space. This roll caddy design is an inexpensive option to help with measurement and cutting of the radiant barrier. It helps to lift and hold the roll of radiant barrier up at a workable height making it easier to measure and cut. Drill a hole in one end of each elbow large enough to fit the quick link through. Attach the snap hooks to each quick link. Screw one elbow onto one end of the black threaded plumbing pipe. Slide the PVC pipe onto the black threaded plumbing pipe (start at end without the elbow attached). Screw the remaining elbow onto the other end of the black threaded plumbing pipe. Locate an area over some floor decking that will allow you secure the chains (either draping over rafters or nailing to studs) to elevate the roll caddy 4 to 6 feet in the air. Secure one side of the roll caddy to one of the chains with one of the safety hooks. Slide the roll of radiant barrier onto the roll caddy and secure the remaining side to the chain with the remaining safety hook. By knowing the height of the roll caddy, you can quickly determine the point at which to cut based on the length you need by taking the end of the barrier down to the attic floor and back up as necessary. For example, if your roll caddy is 5 feet off the attic floor and you need a 15 foot long piece cut, you can quickly determine 15 feet by unrolling three caddy-to-floor sections and then cutting.